At the one-third point in the season, I thought it would be instructive to check how you and your team are doing. The Angels are 27-27 thus far. That's right, your $142 million payroll has produced mediocrity for the second year in a row. Looking forward to next season, I see where you have already committed $80M to seven players. This group includes two starting pitchers, two relievers, two outfielders, and a utility infielder. Unfortunately, you still need to come to terms with three members of your core roster: Jered Weaver, Howie Kendrick, and Kendrys Morales. These arbitration-eligible players will probably cost $10-12M, $6-8M, and perhaps $5M, respectively, next year. Add 'em all up and you've topped $100M for just 10 players, three of whom will do little other than pitch the middle innings out of the bullpen and provide insurance at 3B, SS, and 2B. I understand Vernon Wells has an opt out after 2011. As such, you may be able to reduce your payroll by more than $21M should he exercise it. Do you think the left fielder who is "hitting" .183 and will turn 33 in December will seek greener pastures? I didn't think so. Enough said! What were you thinking when you guaranteed Bobby Abreu's option for 2012 at a cost of $9M in the event he accumulated 1,100 plate appearances in 2010-2011? With just 200 to go to qualify, I suggest you order Mike Scioscia to use him sparingly the rest of the way. You're already on the hook for $39M for two aging outfielders next season. No reason to make it $48M by adding Abreu to the mix unless you're happy with a combined 12 HR in 609 PA this season from these free agent signings of yours. How's that Hisanori Takahashi contract working out? Only 1 2/3 years to go at an average of $4M per! While the 36-year-old reliever with an ERA over 5.00 is neither the worst contract (that honor would go to Vernon Wells), reliever (tie between Brian Fuentes and Fernando Rodney), or lefty (hello, Scott Kazmir) you have signed or acquired, can we agree that it made no sense to ink *two* aging southpaws in Takahashi and Scott Downs to multi-year deals last off-season? Turning to your contract, the Angels signed you to a long-term extension in November 2009. While no terms of the agreement were reported, would you care to at least divulge the length of this arrangement? If not, can you give us a hint? I mean, is it shorter or longer than Wells' contract (through 2014)? Maybe you're just in a slump like Wells, Abreu, Hunter, Takahashi, Rodney, and Kazmir, and will work your way out of it like ... umm ... let me think about that and get back to you. Does the Ump Care How Long the Game Is? During this weekend's Boston-Minnesota series there was another Joe West kerfuffle and the play-by-play guys brought up Joe West's history with Boston. They mentioned West's comments last year that he did not like the Boston Red Sox and New York Yankee style of play, particularly those teams' long games. Setting aside one's own opinion game length and how appropriate it is for an umpire to criticize particular teams, I am sure that umpires — like everyone else — notice when games drag on. But unlike everyone else they are in a unique position to do something about it. So based on West's comments I wondered whether umpires expand the strike zone during long games to speed things along. To look at this I used the, conveniently time-stamped, pitchf/x data. I collected all pitches made in the sixth through eighth innings and the looked at how long into the game each was made. For example, the average pitch in the sixth inning was made 1 hour and 48 minutes after the start of the game. 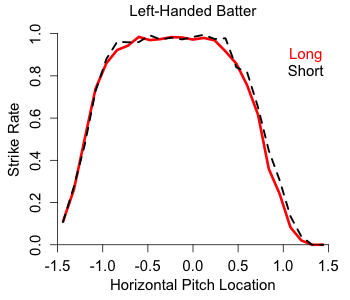 Then I formed two subsets of these pitches, those in the top 5% of length for their half inning, and those in the bottom 5% of length for their half inning. For example the 'long' group included pitches from the bottom of the eighth inning that were thrown 3 hours and 14 minutes or more after the game started. Pitches from the bottom of the eighth inning were included in the 'short' group if they were thrown before 2 hours and 1 minute since the game started. And similarly for other half innings. The top and bottom of the inning were done separately so that pitches from the top of innings didn't over represent in the 'short' group and bottom of the inning pitches in the 'long' group. So these pitches come from situations where the game has already gone on for a very long or short time when they were thrown. Now we are interested in how the strike zone was called on these two groups. Unfortunately there might already be a sampling bias in the data. 'Long' games might have umps with smaller strike zones, that being why the game has gone on so long. So a more clever WOWY approach would be preferential, but I couldn't come up with one. With that limitation in mind let's see how the strike zones of the two groups compared. 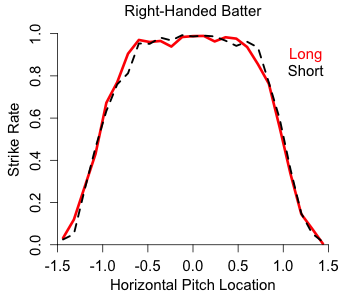 To first see how the top and bottom of the zone were called I considered taken pitches that were clearly in the zone horizontally ( -0.5 > px < 0.5), and looked at their called strike rate by normalized pitch height. Effectively no difference. The top and bottom of the zone were called at close to the same spot for both samples of pitches (and very close to sz_bot and sz_top, showing that the stringers do a pretty good job with these values). 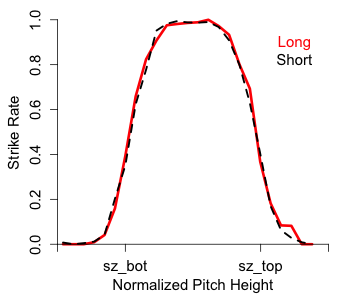 Turning to the horizontal zone I similarly looked at pitches that were clearly in the zone vertically (pz in the middle half of the interval between sz_top and sz_bot), and in this case separated by batter handedness. Again there is almost no difference. And if anything there is a very slight difference on the right edge of the zone (from the umpire's perspective), with the 'long' zone slightly smaller. The opposite effect if the umpire was trying speed the game up. Although the difference is tiny. So overall, at least by this methodology, there is no difference in how the zone is called in long versus short games. If the umpires are annoyed by having to call a game going into its third hour in the seventh inning they don't seem to let it affect their strike zone. Score one for the boys in blue.